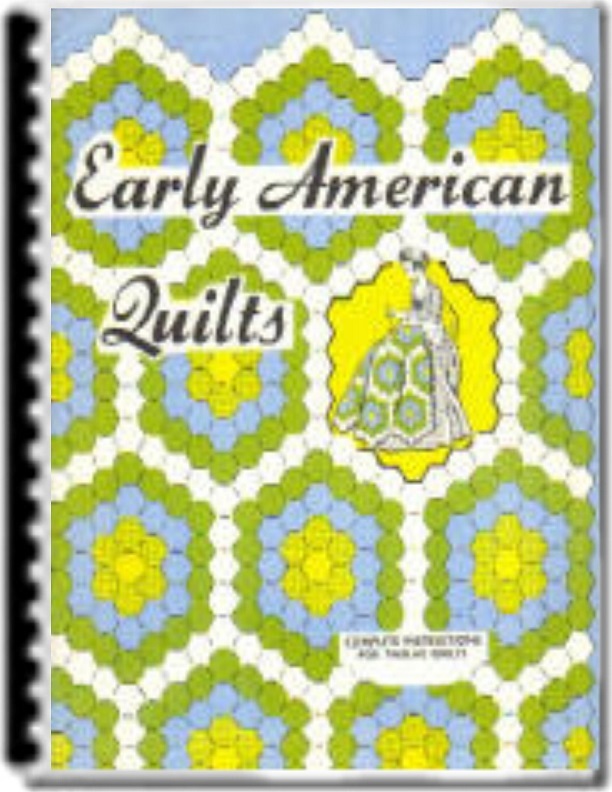 Early American Quilt ebook. 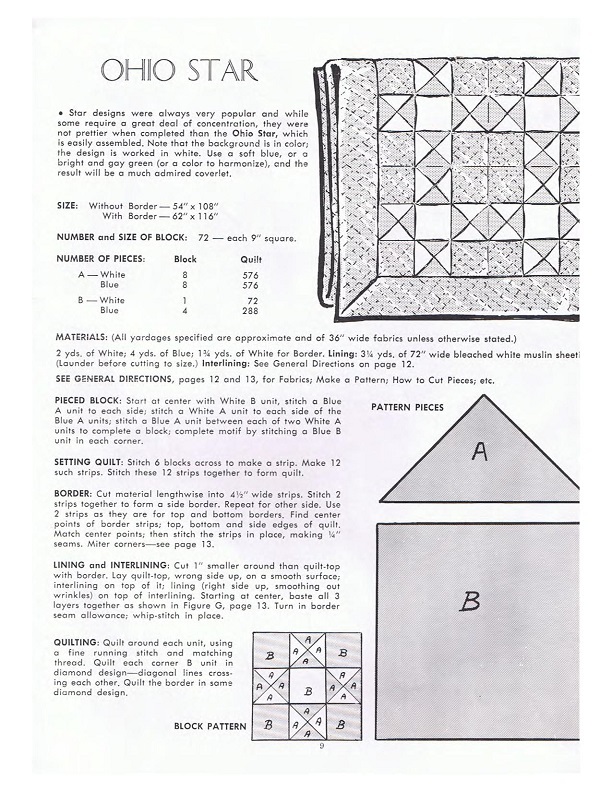 Look to the future by making a quilt that is a pleasure to use now and always! 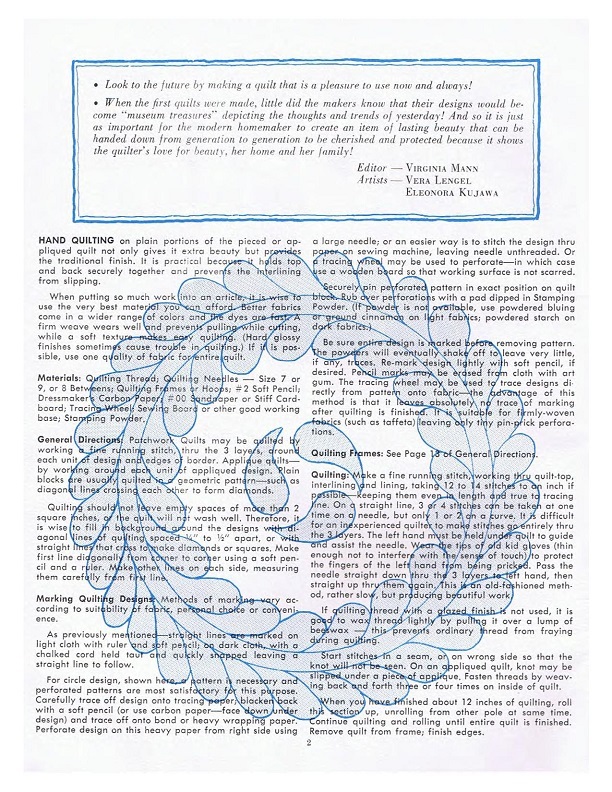 And so it is just as important for the modern quilter to create an item of lasting beauty that can be handed down from generation to generation to be cherished and protected because it shows the quilter's love for beauty, her home and her family. Hand Quilting on plain portions of the pieced or appliqued quilt not only gives it extra beauty but provides the traditional finish. It is practical because it holds top and back securely together and prevents the interlining from slipping. This the nine • patch, variation which is so very closely related to 'Duck-and Ducklings". There are a number of ways to make this particular design, but this is easy and very attractive when completed. Without Border — 60" x 108"
With Border — 68' x 116"
This single hexagon piece may be used to form many lovely designs by changing the color arrangements. The design shown here is called Garden Walk — the white units form the walks around the colored sections which are the flower Beds. In colonial days it was sometimes called Martha Washington's Flower Garden Quilt, or the Old Fashioned Flower Garden. The base of this design is the ever popular and beautiful diamond. By combining white and blue and eye catching coverlet is created! This is a fascinating and complicated motif to make, but well worth the effort when completed. Without Border 72" X 108"
With Border —84" x 120"
A very old design that is still popular! This is a dainty pattern made from very small pieces, and will take a great deal of time and patience. However, when it's finished, you'll find this coverlet one to be treasured not only for the time and effort spent in making it, but for it's quaint beauty. not prettier when completed than the Ohio Star, which to easily assembled. Note that the background is in colors, the design is worked in white. Use a soft blue, or a bright and gay green (or color to harmonize), and the result will be a much admired coverlet. 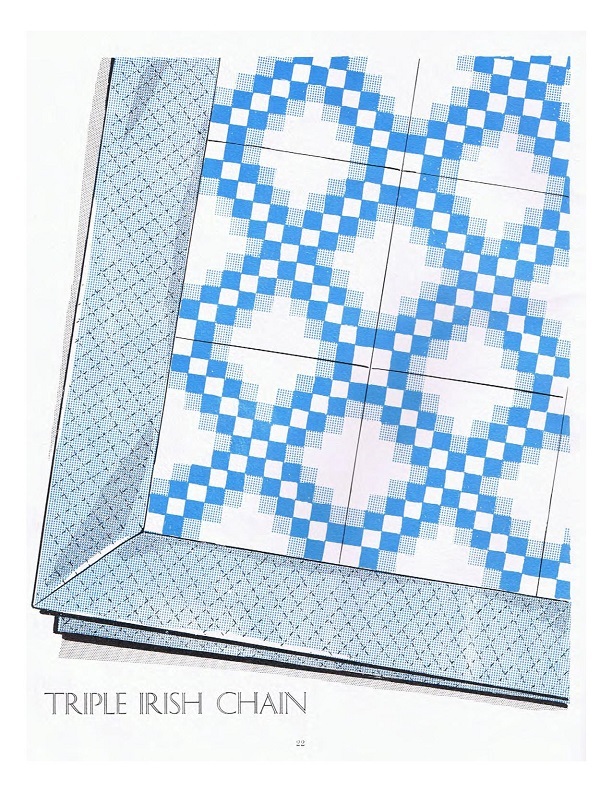 Without Border 54" X 108"
With Border 62" x 116"
There are several names and variations of this lovely design but the block which is set together here is perhaps the most geometric of the variations. 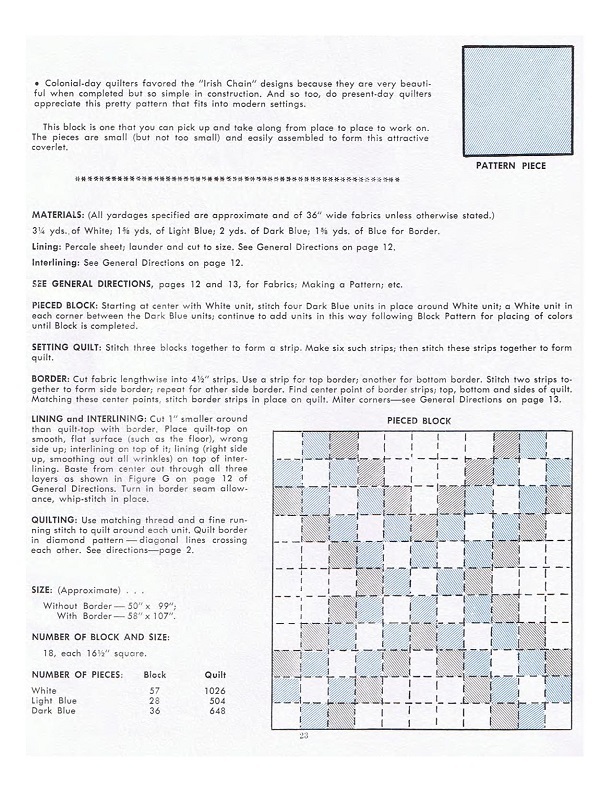 You'll find this a fascinating quilt to make and one that can be worked on leisurely -- for once the piecing is memorized, the stitching is easy. Without Border 56" X 98"
With Border 68" x 110"
appliqued designs to the simple to piece one like this. Of Philadelphian origin, dating back to the early 1800's this block forms a very handsome quilt. Without Border 68" X 103"
With Border 76" X 111"
A simple block to patch and then set together makes this a very attractive quilt. The light pieces and dark form this very old and well-known design —one that fits into the modern setting of today as well as it did in the rooms of yesteryear! Without Border 60" X 100"
With Border 70" x 110"
The star motifs far outnumber all other designs. In this one a variation of the square forms the base for this lovely pattern. 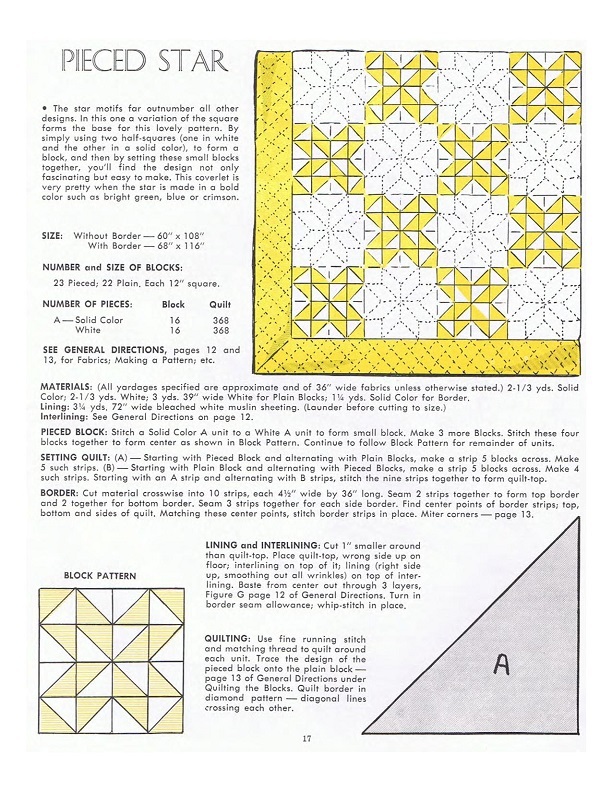 By simply using two half squares (one in white and the other in a solid color), to form a block, and than by setting these small blocks together, you'll find the design not only fascinating but easy to make. This coverlet is very pretty when the star is made in a bold color such as bright green, blue or crimson. 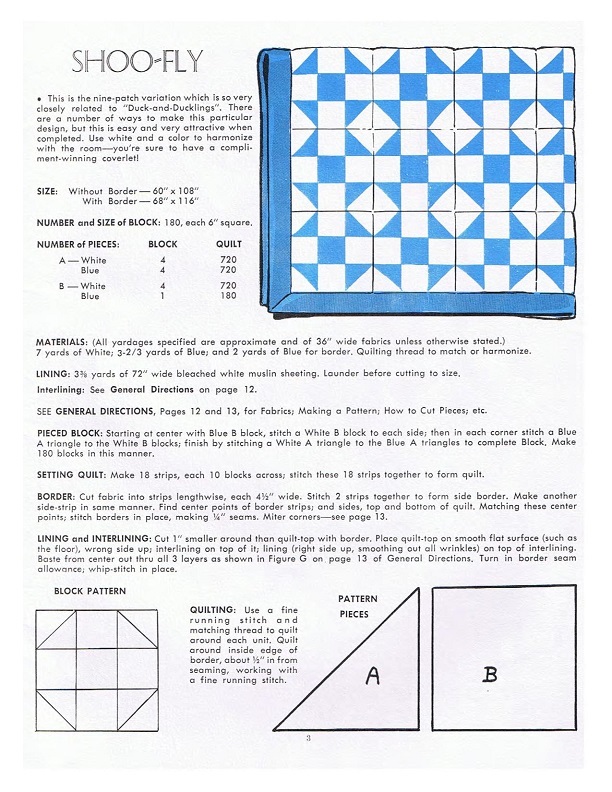 Without Border 60" X 108"
With Border 68" X 116"
This tiny piece can be used to form, many attractive designs which (in their simplest form) were used most often for the childs first lesson quilt making. Without Border 48" X 96"
With Border 62" X 110"
This particular design dates back to the time when every barn had a vane on its roof and, in order to forecast the weather, great-grandmother watched it to see in which direction the wind was blowing. You'll find this a pretty block to set together using just one color and white: or a combination of two harmonizing colors and white. 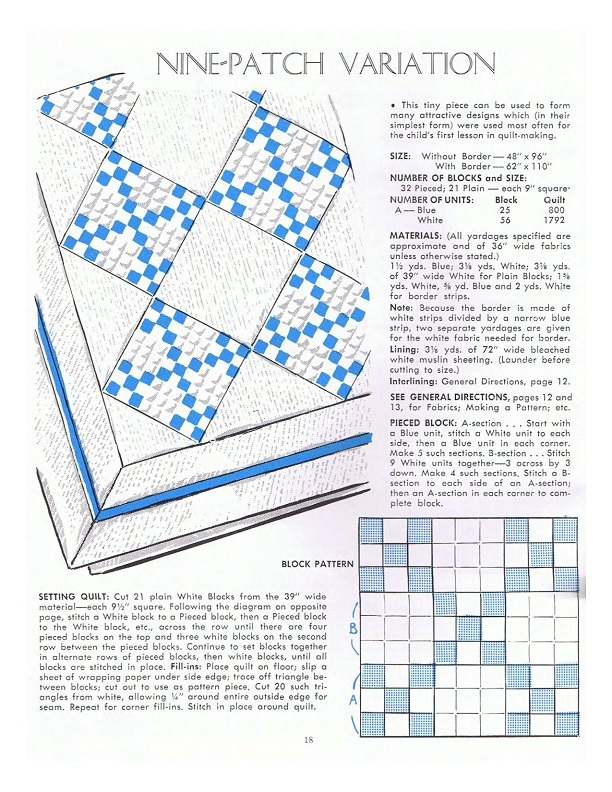 The plain blocks are quilted in on outline of the design, the stitching may be worked in one of the colors of the pieced block to add a touch of color to the white. Colonial-day quitters favored the "Irish chain" designs because they are very beautiful when completed but to simple in construction. 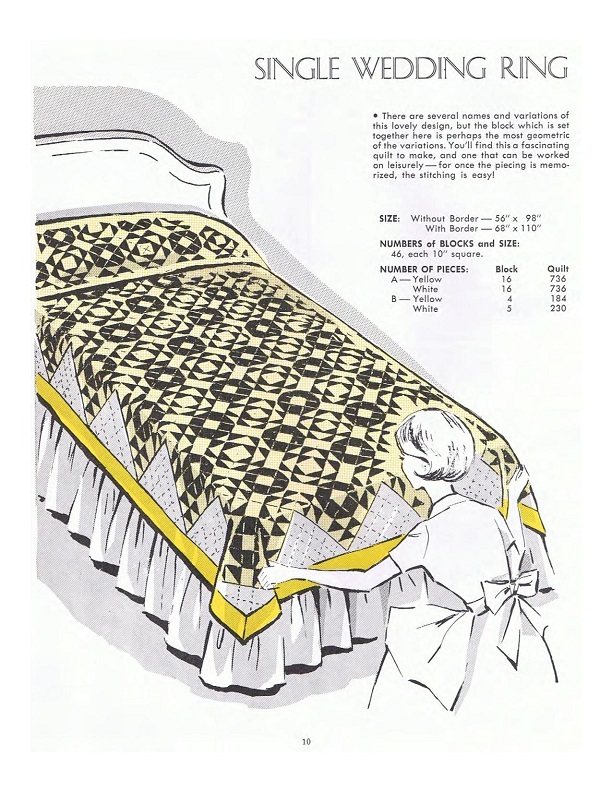 And so too, do present-day quilters appreciate this pretty pattern that fits into modern settings. This block is one that you can pick up and take along from place to place to work on. The pieces are small (but not too small) and easily assembled to form this attractive coverlet. Without Border 50" X 99"
With Border 58" X 107"